I took a mini break from posting. I hope y'all are doing great and having a great week so far. I was busy with some "photography stuffs". The Pictures I took of my friend - who had a photoshoot session for her birthday - turned out great! I am all sorts of excited about them, and I'll share them if or when I'm able. Anyhoo.. back to nails for now. 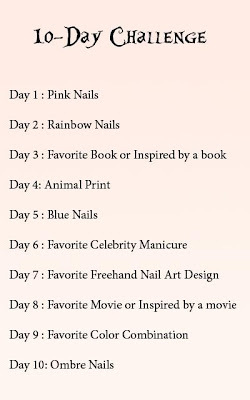 Myself and three other lovely ladies I met because of our love for nail polishes have decided to all do the 10 days nail challenge!! It's a shorter version of the 31 days nail challenge that most nail bloggers were partaking in. We start the challenge tomorrow, and this should definitely motivate me to doing something fun. My love affair with nail polish might not be as strong as it is with photography, but when something fun like this comes along, I get all sorts of excited! 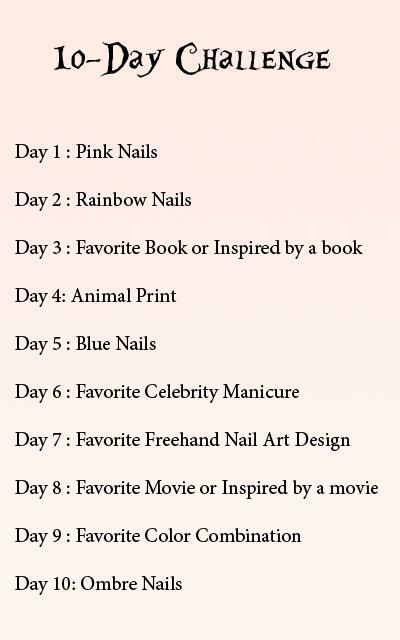 Here's a list of the Nail designs (colors) we will do during this 10 days Nail challenge. Day Ten - Ombre Nails..
Now, as I stated earlier, I will be doing this challenge with Carinae over at Carinae L'etoile's polish stash, Tamira at naudii beautii and Ida at Piece of Pie. Head on over to their pages and follow them if they're not already on your blogroll. I'm sure they'll come up with wonderful and creative ideas in the next 10 days. I'm excited I'm not alone in this. I already have ideas in my mind and can't wait to show you guys all I come up with. yay! Can't wait to see the designs! Have fun ladies! excited to start! im about to post about this too. kinda irked tho cause i thought i had my memory card in my cam and didnt *facepalm* so imma just take a pic as is =| and work on day 1! WOW... You created the challenge Marketta? That's amazing!!! Yep, I did it, and had fun completing it. Thanks for the comment.